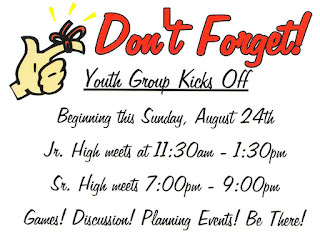 This week we are having our first real weekly youth group meeting. This is a group of students who is not used to in-depth study of Scripture and they are not used to getting together weekly. I have very little idea of how many students I should expect tho show up there. I admit that I am a bit anxious that the numbers will be uncomfortably low. I am worried that my style of teaching the Bible will simply not relate with them. I am worried that the timing is all wrong (we're meeting on Sunday night, the night before they all go back to school for the Fall). I am worried that parents will not be pleased with how I do things. I am worried that I will not meet their expectations. I am worried that the whole thing will come crumbling down. I am worried, I am worried, I am worried. I realize that all the pressure and anxiety that I feel is placed there not by anyone else but by myself. It has not been placed there by God because from God I have the freedom to empty myself, to become nothing because the peace of God guards my heart and my mind in Christ Jesus who also became nothing. I don't have to worry about meeting the expectations of others. I don't have to worry about succeeding. I can participate with Jesus in his freedom. I have the freedom to simply give myself to this church just as I am, though I may be nothing. "Do not worry about anything..."
So I look forward to this weekend, liberated from all the games of trying to be what I am expected to be. I am me. I am free to be me.